Karina's Kreations: Stampin'Up Joyful Christmas Pop'n Cuts Gift Card Holder! 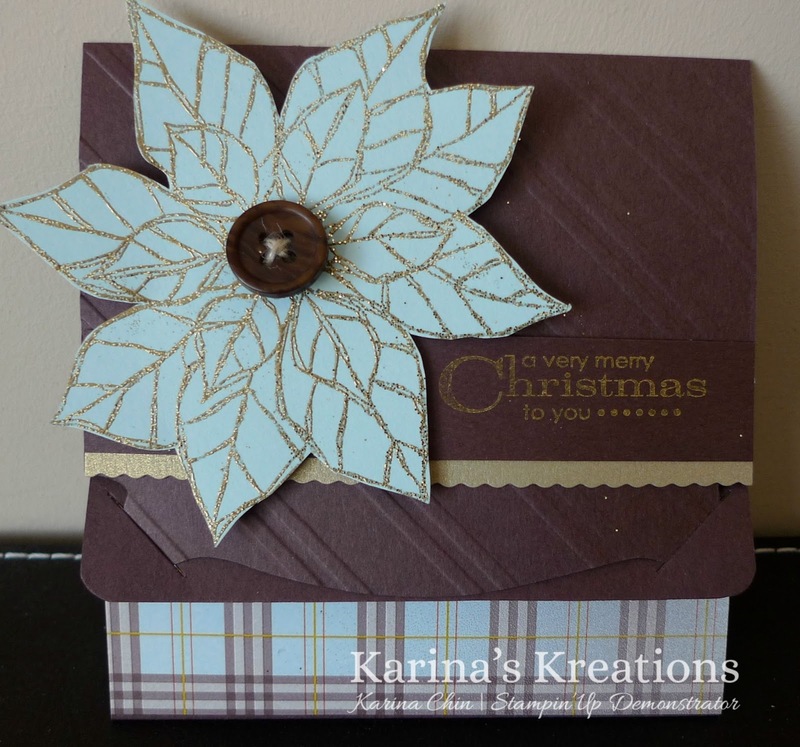 Stampin'Up Joyful Christmas Pop'n Cuts Gift Card Holder! I'm in Millet today at a really fun stamping day put on by Christy Harsch. We have annual meeting where we get together at an all day event and do make & takes, see product demonstrations and swap some cards! This event was one of the reasons I first bought the starter kit. I wanted to come to these events!!! You're welcome to buy the starter kit too and come with me next time!!! I have been asked to present a wow project. It thought it would be easy but I couldn't decide what I wanted to show!!! There are too many fun ideas!!! I decided on a technique where you combine 1 tsp of Gold Stampin Glitter with 1 tsp of Gold Embossing powder. Just stamp your image with Versa Mark ink, pour the glitter mixture over top and emboss with the heat gun. I have a tip though! Make sure your gun is hot before you try to emboss your image. Otherwise, the glitter blows every where!!! I designed two cards and one gift card holder. This is my gift card holder. What do you think? It uses the new Joyful Christmas stamp set #131805. This is one set I was not going to buy however I have seen so many cute cards made with this set that I changed my mind. 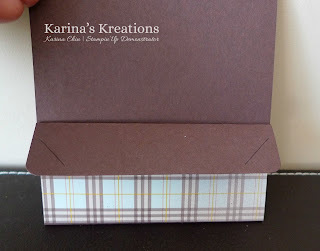 To make this gift card holder you need the Card Base Pop'N Cuts Die #130099. I started with 4-1/4" x 11" Chocolate Chip card stock, placed it on the die and rolled it through the Big Shot die cut machine. Score the card stock at 1", 3" and 7-1/2". Fold the Bottom up at the 3" score line and then back at the 1" score line. Secure the gift card opening with sticky tape. 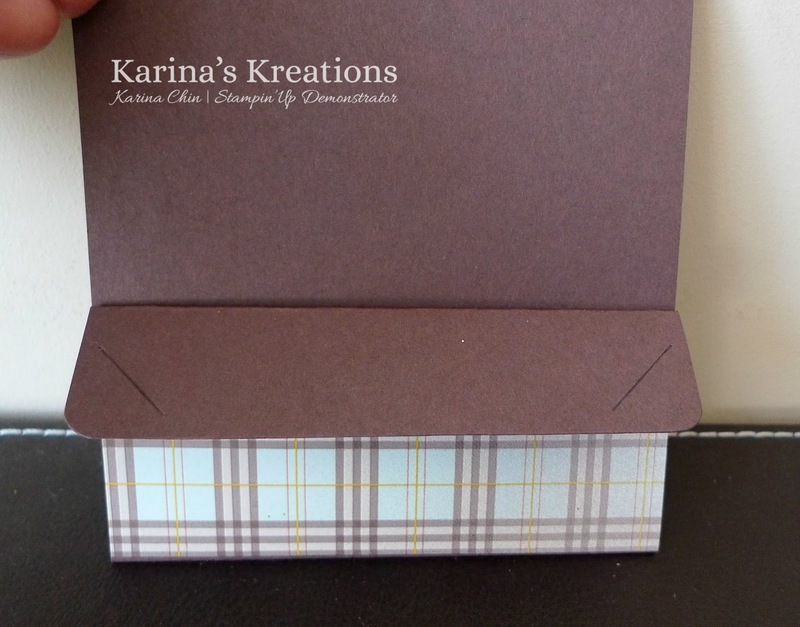 The top part has the curved edge and had slits that go into the bottom part to close the gift card holder. So easy!!! My card stock colours are Chocolate Chip, Soft Sky & Brushed Gold. I used the Sweater Weather Designer Series Paper too. I hope you like my gift card holder and my WOW technique!